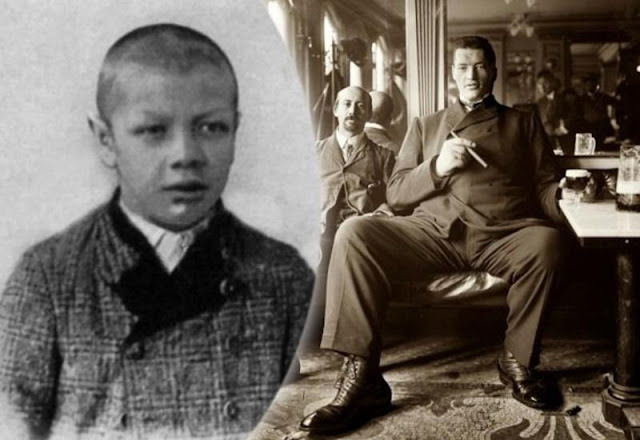 Born 1899 in Graz, Austria-Hungary, Adam Rainer is the only person in recorded history to have been both a dwarf and a giant. 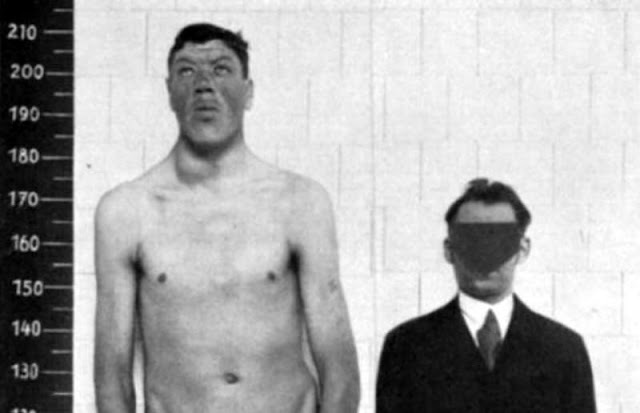 He is believed to have had acromegaly. From birth into adulthood, Rainer was always short. But at 21 he began a growth spurt that made him over seven feet tall—just 10 years later. Here's the story of how it happened. 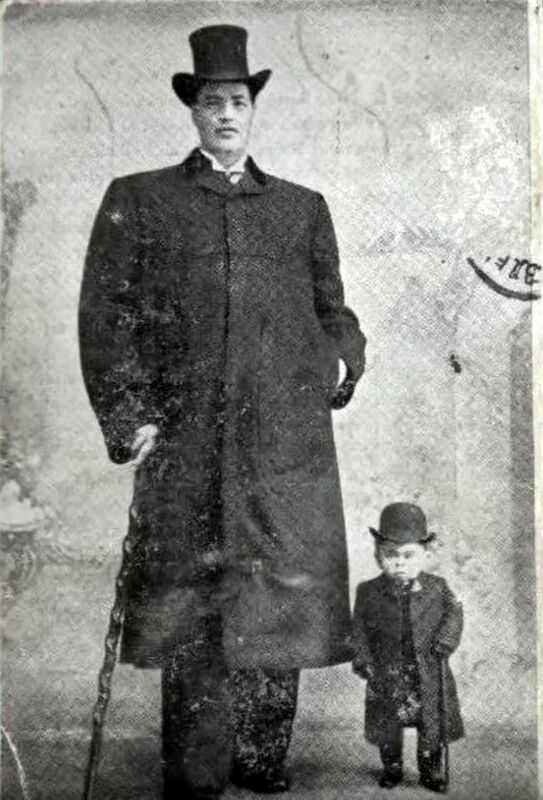 At age 18, Rainer was 4 feet 6.3 inches tall, which classified him as a dwarf. Dwarfism is typically defined as an adult height less than 4 feet 10 inches. When he was 18, he tried to join the army, but was rejected for being too short and weak. He tried to enlist in the army again at age 19, since he had grown a bit taller. That time, he measured 4 feet 8.3 inches tall. But the army rejected him again. When Rainer was 21 years old, he began a dramatic growth spurt. 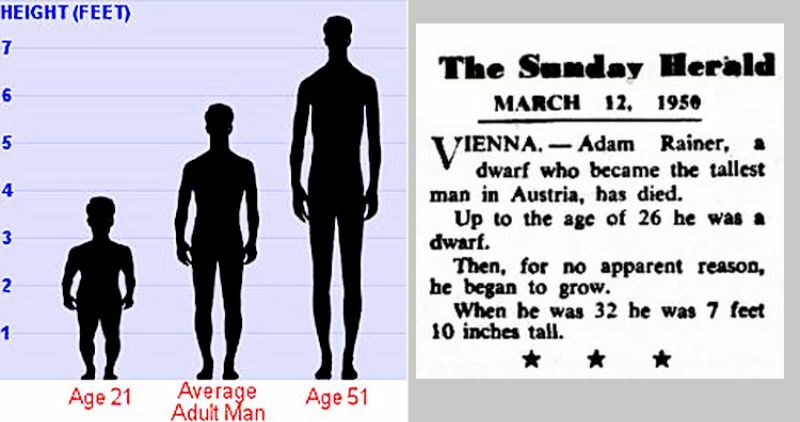 By age 32, he was over seven feet tall. As Rainer grew, his health started to go downhill. In the late 1920s, when Rainer was approaching 30 years of age, he lost his appetite, developed a spinal curvature, and started having difficulty walking. He also became nearly blind in his right eye, and deaf in his left ear. Doctors discovered a tumor on his pituitary gland that caused an overproduction of growth hormone. This condition is called acromegaly. Rainer developed a number of the typical symptoms including enlarged hands and feet, a protruding forehead and jaw, and teeth that are more widely spaced than normal. In 1930, doctors removed Rainer's tumor to try to stop the overproduction of growth hormone. The doctors said there was only a slim chance that the operation would work, because the tumor had been growing for 10 years. When he was measured again a few months later, his height was the same as the previous measurement. But it turned out his spine had become more curved, which meant that while his standing height was the same, his body continued to grow. Rainer died in 1950 at the age of 51. There's conflicting information about how tall he was when he died. Some sources say it was 7 feet 10 inches, others say 7 feet 8 inches.